Bernard John Brown commonly known as Bunny since school days, was born into a family of 5 boys being the second youngest and raised in Birmingham. Joined the Army Cadet Force while still at school attaining the rank of RSM which would bode him well in his service within 131 Parachute Engineer Regiment RE (V) in which he enlisted in 1965 at 301 Squadron, Birmingham. His service allowed him to travel to places which you only ever read or hear about. Countries he served were Bahrain, Libya, Germany, Cyprus, France, Holland, Denmark and the UAE. Along the way he was awarded the French and German Parachute wings which he wore with pride. Awarded the Green Beret on completion of the All Arms Commando (conversion) course when the then 131 Independent Parachute Squadron Royal Engineers (V) converted to 131 Independent Commando Squadron Royal Engineers (V). In which he continued his TA service. Bunny was a founding member of the Commando Freefall Team with other members of 131. 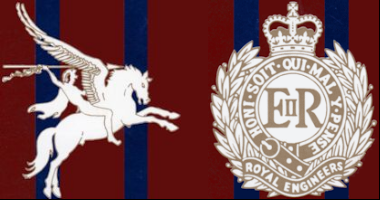 He was also one of the founding members of the Airborne Sappers Association, which ultimately became the Airborne Engineers Association when other associations joined forces. He was very proud to have been a member of the AEA and especially proud to become Chairman and after his term, a Life Vice President of the Association. Bunny left 131 Squadron after some 26 years service with the rank of SQMS - a hard act to follow. Bunny was married twice, first to Jackie which resulted in 2 children Ann-Marie and David. Secondly to Jan which also produced 2 children, Hayley and Sean. David and Hayley both enlisted into the regular army and are still doing very well in their chosen Regiments. Bunny's civilian employment was many and varied from an apprentice at the BSA motorcycles factory to tree surgeon to carpenter. But suspended ceiling instalment was what he was most happy doing and at one time ran his own business. In 2017 Bunny was diagnosed with a brain tumour, which obviously knocked everyone attached to him sideways. He had Chemotherapy which didn't work as expected followed by several radiotherapy treatments which did work and prolonged his life considerably. Unfortunately his decline in the early to middle part of 2018 saw him readmitted into hospital several times and in the early hours of the 17th May 2018 the family received a call to make their way to the hospice where he was being cared for and at 04:50 hrs. Bunny took his last breath with his wife and close family around him. His funeral, held at The Woodlands Cemetery, Coleshill on 8th June was attended by family, friends, dozens of former colleagues of 131 and AEA members. 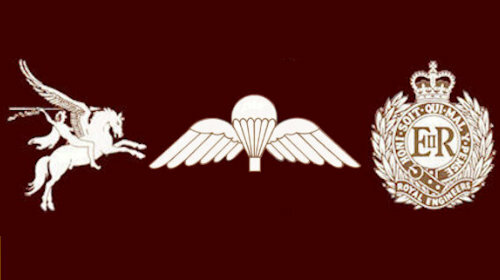 The latter all suitably attired in maroon or green berets together with elements of serving soldiers and Association and Regimental standards. The funeral cars were escorted to the Chapel by the Branch Standard and piper. An outstanding turnout in my humble opinion. Throughout Bunny's illness he and the family received tremendous support from SSAFA case workers.